The French capital's own domain .PARIS has been made available for registration to trademark holders as well as anyone wishing to demonstrate their geographic, cultural or emotional affiliation with Paris. 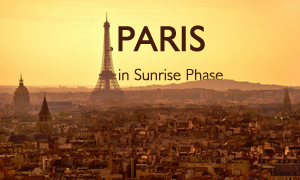 Following the first .PARIS domain names registrations by 100 .PARIS ambassadors on June 4th, the .PARIS domain has entered into the Sunrise phase. From 9 September to 11 November 2014, trademark holders will be granted priority when applying for .PARIS domain names as registration is also open to companies and public administration offices from the Greater Paris Area (Région Île-de-France). .PARIS domain names are also available for registration to individuals but, at this stage, their applications will be processed after applications filed by trademarks and right holders. Beginning December 2 2014, .PARIS will be available to the general public on a first-come, first-served basis. It can be expected that .PARIS domain will gain popularity following the example set by other geographic TLDs: .BERLIN, .LONDON or .TOKYO with over 138,000, 36, 200 and 22,400 domain name registrations respectively. If you wish to show your link to your city or region, please click the selected domain for registration information.